Article 2 of the United Nations Framework Convention on Climate Change (UNFCCC) calls for stabilization of greenhouse gas (GHG) concentrations at levels that prevent dangerous anthropogenic interference (DAI) in the climate system. 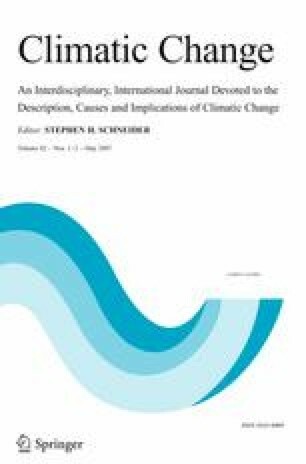 However, some of the recent policy literature has focused on dangerous climatic change (DCC) rather than on DAI. DAI is a set of increases in GHGs concentrations that has a non-negligible possibility of provoking changes in climate that in turn have a non-negligible possibility of causing unacceptable harm, including harm to one or more of ecosystems, food production systems, and sustainable socio-economic systems, whereas DCC is a change of climate that has actually occurred or is assumed to occur and that has a non-negligible possibility of causing unacceptable harm. If the goal of climate policy is to prevent DAI, then the determination of allowable GHG concentrations requires three inputs: the probability distribution function (pdf) for climate sensitivity, the pdf for the temperature change at which significant harm occurs, and the allowed probability (“risk”) of incurring harm previously deemed to be unacceptable. If the goal of climate policy is to prevent DCC, then one must know what the correct climate sensitivity is (along with the harm pdf and risk tolerance) in order to determine allowable GHG concentrations. DAI from elevated atmospheric CO2 also arises through its impact on ocean chemistry as the ocean absorbs CO2. The primary chemical impact is a reduction in the degree of supersaturation of ocean water with respect to calcium carbonate, the structural building material for coral and for calcareous phytoplankton at the base of the marine food chain. Here, the probability of significant harm (in particular, impacts violating the subsidiary conditions in Article 2 of the UNFCCC) is computed as a function of the ratio of total GHG radiative forcing to the radiative forcing for a CO2 doubling, using two alternative pdfs for climate sensitivity and three alternative pdfs for the harm temperature threshold. The allowable radiative forcing ratio depends on the probability of significant harm that is tolerated, and can be translated into allowable CO2 concentrations given some assumption concerning the future change in total non-CO2 GHG radiative forcing. If future non-CO2 GHG forcing is reduced to half of the present non-CO2 GHG forcing, then the allowable CO2 concentration is 290–430 ppmv for a 10% risk tolerance (depending on the chosen pdfs) and 300–500 ppmv for a 25% risk tolerance (assuming a pre-industrial CO2 concentration of 280 ppmv). For future non-CO2 GHG forcing frozen at the present value, and for a 10% risk threshold, the allowable CO2 concentration is 257–384 ppmv. The implications of these results are that (1) emissions of GHGs need to be reduced as quickly as possible, not in order to comply with the UNFCCC, but in order to minimize the extent and duration of non-compliance; (2) we do not have the luxury of trading off reductions in emissions of non-CO2 GHGs against smaller reductions in CO2 emissions, and (3) preparations should begin soon for the creation of negative CO2 emissions through the sequestration of biomass carbon.